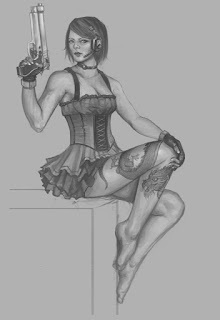 No self-important opinions this time, just an update on my Saints Row character painting. Gonna take a break on this one, for tonight at least (although I don't know if that counts so much as a break, because I did spend the day on it). There's another quick grayscale study I'd like to do, so I'll hop on that instead. I'm still fairly happy with this piece, though, so I'll probably aim to take it to completion. Ugh, tomorrow I have to focus on my UDK work again... I donno, I really enjoy working in UDK, but for some reason lately I've just been wanting to draw!